For long range passagemaking does the motor sailor have merit? What is the optimum hull form for a motor sailor? What's the best rig choice? Can a motor sailor be fast and efficient? This article attempts to answer these questions with an eye toward the requirements of ocean voyaging. Michael Kasten. 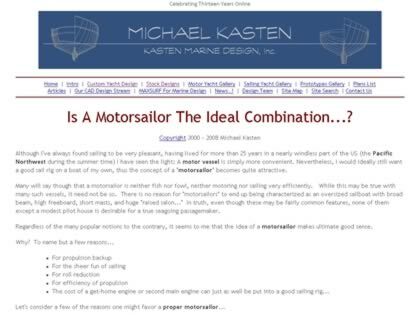 Web Site Snapshot: If available, above is a snapshot of the The Ideal Motor Sailor web site at http://www.kastenmarine.com/idealMS.htm as it appeared when this site was added to the directory or last verified. Please Note that Boat Design Net has no involvement with the above web site; all content and images depicted in the above thumbnail are the property and copyright of The Ideal Motor Sailor unless otherwise noted on that site. Description: For long range passagemaking does the motor sailor have merit? What is the optimum hull form for a motor sailor? What's the best rig choice? Can a motor sailor be fast and efficient? This article attempts to answer these questions with an eye toward the requirements of ocean voyaging. Michael Kasten.